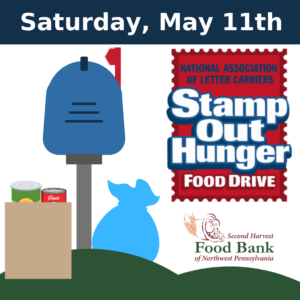 On the second Saturday in May, letter carriers throughout northwest Pennsylvania join Second Harvest to Stamp Out Hunger! The community is asked to donate nonperishable donations in a sturdy bag and leave by their mailbox in the morning. Local letter carriers, volunteers and Boy Scouts will be collecting donations from homes and delivering them to the Second Harvest or Second Harvest member agencies in outlying areas. In order to aid the letter carrier’s, Second Harvest enlists the help of community volunteers for the Stamp Out Hunger Food Drive each year. For each of our drop-off sites Second Harvest needs volunteers to drive around the surrounding area and collect the nonperishables from mailboxes. Additionally, we need Site Helpers at each drop-off sites to aid Second Harvest staff members in loading the donated food onto our trucks. If you’re interested in volunteering at this event, please review our list of volunteer sites below, then fill out and submit the volunteer form. If you have any questions about volunteering, contact Andrea Velez at 814-459-3663 x 113 or avelez@nwpafoodbank.org. 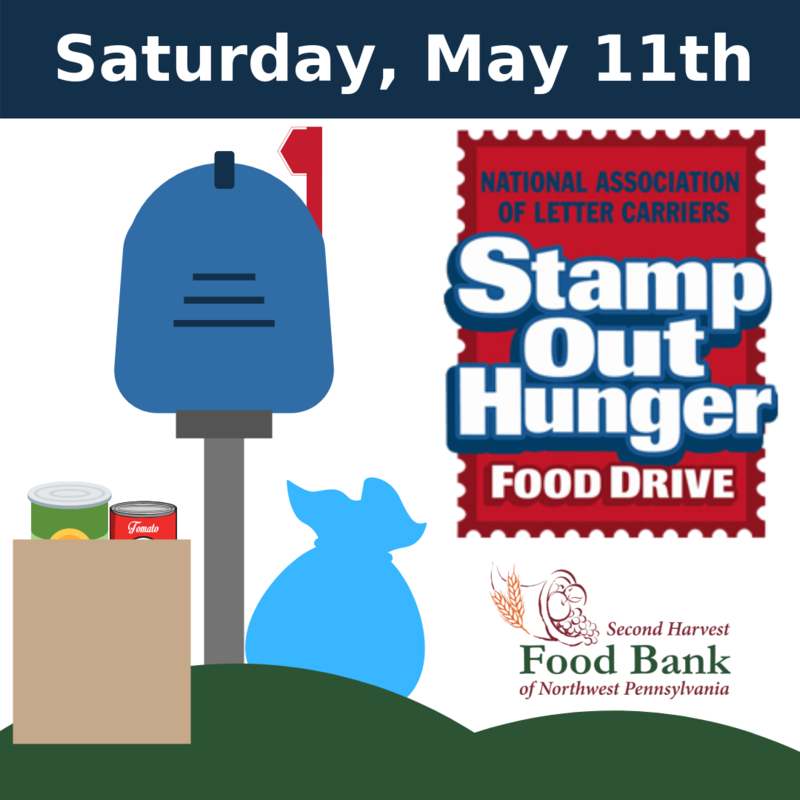 **Please distinguish whether you plan to help drive and pick up donations from mailboxes or stay onsite as a Site-Helper loading donations onto the Second Harvest vehicle.